Chef's Delight: Make your sous chef drool with one glass door refrigerator for them, and one for you! It's the epitome of gourmet kitchen design: White marble island countertops -- perfect for kneading dough -- along with a pot filler, an island sink, and some seating for guests. Add in a professional range under a massive wood hood, and you have one sizzling kitchen! 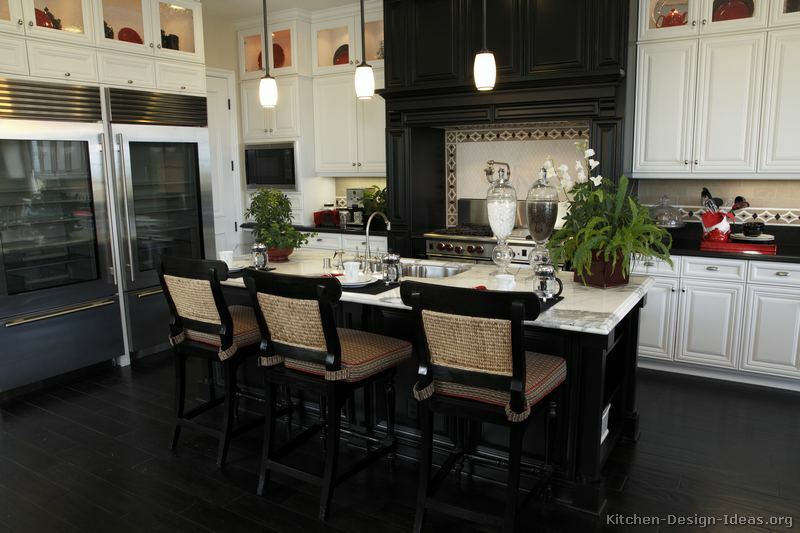 More Pictures: Click for more photos of this beautiful black and white kitchen, which is #104 in the two-tone kitchens gallery. Thumb through the featured photos on Gourmet Kitchen Design as well.